Expedia has some great Ahmedabad travel packages waiting for you. Combining your airfares and lodgings is one of the most straightforward ways to save money on your vacation. With more than 400 airline partners and 321,000 worldwide properties, our exhaustive database can help you reach your ideal destination. We've got all the hot sightseeing tips for your next trip to Ahmedabad. Grab your planner and prepare to start topping up your itinerary. Are you eager to learn about the local cultural and religious traditions? Join devoted worshipers at Jama Masjid Mosque and enjoy a look into Islamic life. Travelers have a wonderful selection of things to do in this destination. Choose a suitable vantage point and observe the people rushing by at Manek Chowk. If you're the talkative type, this enduring gathering point is also an awesome spot to hang out with a couple of the locals. Still have time to spare? Forget your history books! Let the past jump off the page at Sanskar Kendra Museum. After a great day of adventures, you'll be in need of a soft bed. Fortunately, there's a wide range of properties in Ahmedabad. Decide from as many as 35 options and kick-start your cheap vacation or luxury getaway. If you need to watch your bank balance, why not investigate low-cost accommodations such as the Hotel Volga (Near Ankelsharia Hospital) and the Hotel Good Night (Opp. sidi saiyed's Jali)? Both have great reviews! Ahmedabad is not short of swanky hotels either. 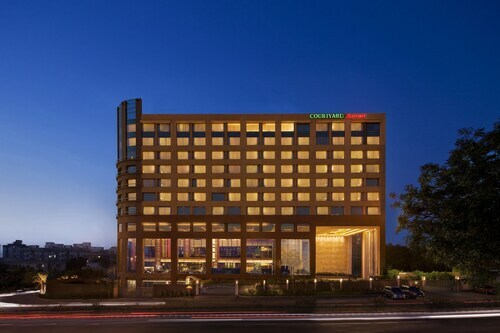 If you prefer, spend your evenings in style at the Radisson Blu Hotel Ahmedabad (Near Panchvati Cross Roads) or the Four Points by Sheraton Ahmedabad (Opposite Gujarat College, Ellis Bridge). From the instant you finally step off the plane at Sardar Vallabhbhai Patel International Airport (AMD), you'll know your exciting trip to Ahmedabad has well and truly started! Well, the center of the neighborhood will still be 5 miles (8 km) away, but near enough. This ancient and desolate ruined city provides a fascinating insight into the life of the Harappan culture and the Indus Valley Civilization. Discover the life of Mahatma Gandhi, visit his former home and learn about India’s fight for independence at this thought-provoking ashram and museum. Marvel at the fascinating ornamentation of this 15th-century historical well and monument, which is a spiritual resting place for traveling pilgrims. Intricately designed pillars, elegant domes and a sparkling marble courtyard make this one of Ahmedabad’s most attractive and interesting religious monuments. Sample traditional Gujarati street food, shop for jewelry and textiles and spot historical landmarks at this lively square in Ahmedabad’s old town. 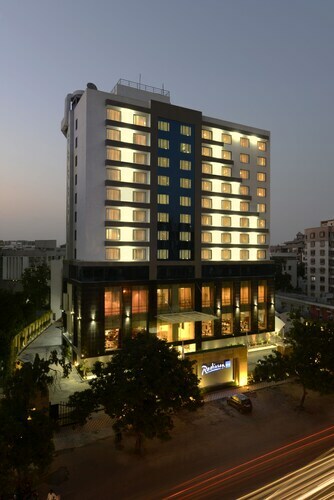 This family-friendly Ahmedabad hotel is located in Usman Pura, within 3 mi (5 km) of Sardar Patel Stadium, Swaminarayan Temple, and Sabarmati Riverfront. 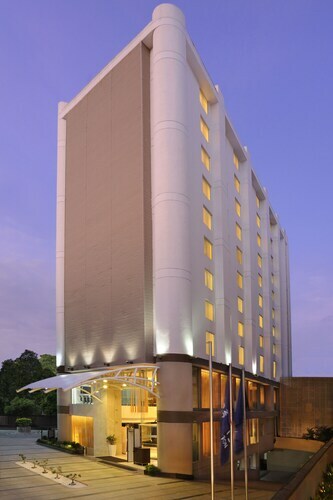 Located in the heart of Ahmedabad, this luxury resort is within 1 mi (2 km) of Ahmedabad One Mall and Gujarat University. Gulmohar Park Mall and ISCON Mall are also within 3 mi (5 km). Located in Ahmedabad City Centre, this luxury hotel is within 2 mi (3 km) of Sanskar Kendra Museum, Manek Chowk, and Jama Masjid Mosque. Sardar Patel Stadium and Swaminarayan Temple are also within 3 mi (5 km). 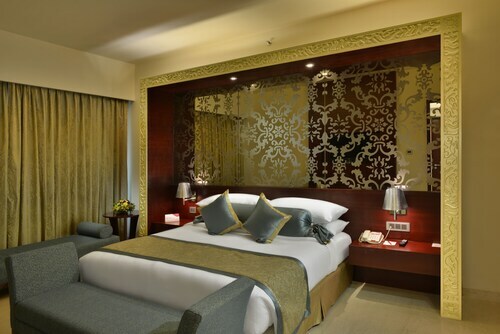 These hotel accommodations are located throughout the area in Ahmedabad. Located in Ahmedabad City Centre, this luxury hotel is within 2 mi (3 km) of Sanskar Kendra Museum, Sardar Patel Stadium, and Manek Chowk. Jama Masjid Mosque and Gujarat University are also within 3 mi (5 km). 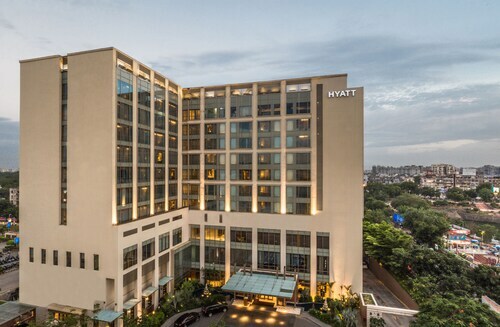 Located in Prahlad Nagar, this luxury hotel is 1.1 mi (1.7 km) from Gulmohar Park Mall and within 9 mi (15 km) of Manek Chowk and Sabarmati Riverfront. Mahatma Mandir is 18.7 mi (30.1 km) away.